The potential consequences of compromising Zcash’s trusted setup range from the fairly benign (someone buys themselves a private island) to the cartoonishly evil. The worst-case scenario is literally people dying. Maybe even a lot of people. If it’s ever discovered that Zcash’s trusted setup was compromised, the entire blockchain would probably be thrown out (and/or lose its value) because it would mean the whole thing is full of funny-money and nobody knows who has it or how much there is. In the event of compromise, loss of money ($) following discovery of compromise is the best-case scenario. The worst-case scenarios occur when nobody finds out. In the rare instance this problem is mentioned, it is referred to as “secret inflation” — a notion misleading to the point of being wrong. If the U.S. Government prints $1 trillion dollars in secret (meaning: nobody knows about it), then sure, technically “monetary inflation” occurs, but it has no immediate effect on the value of the dollar, and it might never have a noticeable effect. Those dollars are just as capable of financing wars as all other dollars, and their impact on the value of the token can be masked by any growth in the value of the currency. It’s also very important to understand that compromising the trusted setup grants one the general power to create certain types of false proofs that are accepted as true, of which counterfeit coins are but one result. Don’t let fancy whitepapers fool you, the “at least one honest participant” thing in Zcash’s trusted setup is security theater. 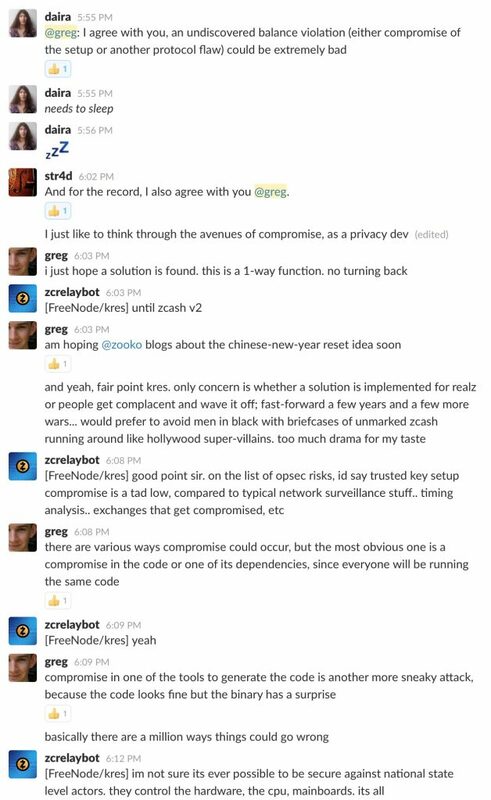 Task a few professional saboteurs with infiltrating the Zcash team (governments were potentially aware early on), or conduct surveillance of the team’s communications. Learn their plans for the trusted setup. Insert a vulnerability into the code or one of its dependencies (since everyone will be running the same code). More sneaky: compromise one of the tools that’s used to build Zcash, that way the code looks fine but the binary has a “surprise”. Modify the binaries after they’ve been generated and verified. Use a hardware backdoor in the CPU (or a handful of 0-days) to root everyone’s machine and sabotages all attempts at detection. I have to admit that I failed to make adequately clear in our previous post that an audit is not enough. That post was written before I realized the (now obvious) central point of failure in Zcash’s trusted setup, and that was before I watched as multiple experts looked and failed to detect the bug that caused the fallout from Ethereum’s “The DAO” DAO. There are some things you simply cannot audit sufficiently for. This is one of them. Prevent anyone from getting it. Get your hands on it first. Develop your own version of the same thing (or worse). Make no mistake: as long as Zcash is considered valuable, whoever compromises Zcash holds the key to a very dangerous weapon. Update February 6, 2017: STARK! What there is not enough of is the common sense to use those instead. Tossing a loaded gun into a school yard. Operating heavy machinery while intoxicated. Begging nation-states to take invisible control of your no-longer-decentralized magic internet money to secretly finance their dirty business… for no good reason. When a digital weapon falls into the wrong hands, what does Matthew Green have to say? 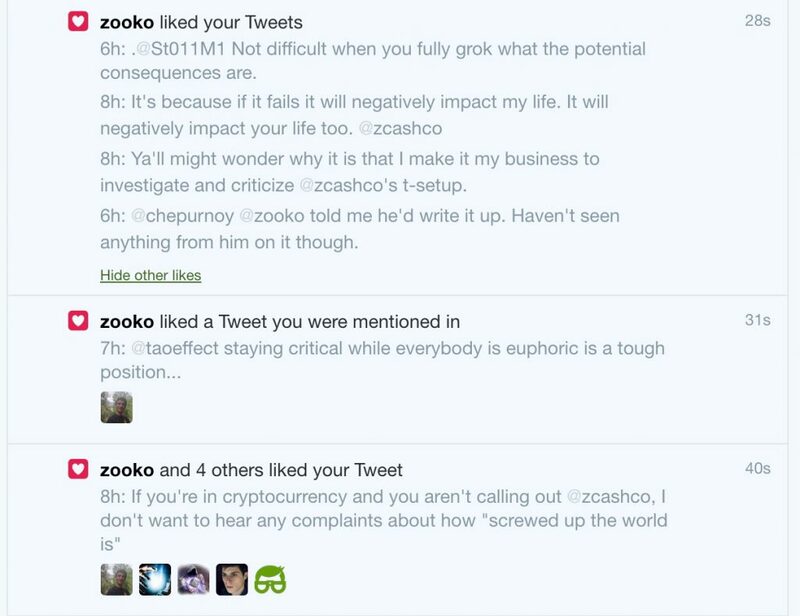 He’s a great guy and part of me wonders if those notifications are an indication of a cry for help, but whatever the case, one thing is clear: we cannot be the only ones talking about this.6 So please speak up, demand better, and ask the Zcash team to follow their own advice. Thanks to John Light, Andrea Devers, and Simon Grondin for reviewing this post. You can follow the author and the turtles. Writing these posts takes time and money! Zcoin ( http://zcoin.tech ) and ZCash are the only two cryptocurrencies that use zero-knowledge proofs to guarantee complete financial anonymity. ZCoin and ZCash seem to supplement each other quite nicely, and a good way to describe it would be sibling cryptocurrencies. They are related in the sense that the academic community often see ZCoin as the stabler, more secure, and more proven cryptocurrency – whereas ZCash is seen as the more experimental coin using more dangerous and risky cryptography. For example, ZCoin uses the Zerocoin paper, which has been cited about 200 times by academic scholars, according to Google Search. And ZCash is cited about only half as many times. So ZCoin has about twice as much support from cryptography scholars as ZCash, because it’s based on much more stable and proven cryptography. On the other hand, ZCash has a lot fewer cryptography citations because it is based on something called ZK-Snarks, which only a few people in the world have researched. 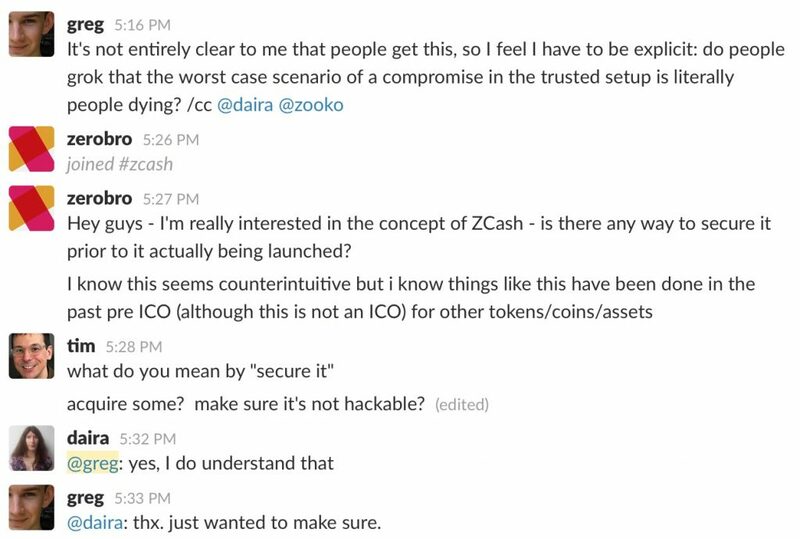 Because ZCash is based on more risky cryptography, ZCash has this critical problem that ZCoin doesn’t face. ZCash attempts to conceal the amount of money sent in a transaction. By doing this, if ZCash has a major bug or double-spending problem, it would be unnoticed and someone could drain tens or hundreds of millions of dollars away from the ZCash market cap without anybody noticing a double spend. Any project that involves new cryptography, including projects like ZCash, faces vulnerabilities. As we’ve seen with the Ethereum DAO project, about two hundred million dollars was drained away. Luckily, that money was recovered through a bailout because it was noticed and viewable on the public blockchain. But if ZCash faced a bug, it could potentially see hundreds of millions of dollars drained from its market cap and ZCash would be worth a lot less for speculators. In terms of practical differences, the only main differences are that zerocash is a version of the zerocoin protocol that conceals the amount in the transaction. It uses different cryptographic schemes, but the end result is that the other information is all completely hidden through zero-knowledge proofs. Which guarantee 0 information about transaction recipient and sender. However, that hiding of quantity sent in a transaction has the vulnerability of speculators potentially losing a lot of money through double-spends / other bugs that go unnoticed because of the hidden quantity. So I think ZCoin ( http://zcoin.tech ) could be a good supplement investment / hedge to ZCash. While I’ve heard of Zerocoin, this is the first time I’m hearing about “ZCoin”. The project mysteriously appeared on GitHub only a few days prior to this post, the reddit is a ghost town that appears to have been created today, and yet Zcoin is apparently launching in a few days on September 28th. I would strongly advise people to stay clear of ZCoin based on that alone. This is not how you launch a blockchain. The reddit appears to have been launched recently, but they have a very active community on Slack. Also, they’ve received funding from Roger Ver. Evaluating, reviewing, and testing a cryptocurrency requires a lot of lead time. Normally there is a testnet, opportunities for community review and feedback, etc. From what I understand, they’ve been running a testnet for over a year now. > From what I understand, they’ve been running a testnet for over a year now. Who is “they”? The code has been up for only a few days. How is it possible for people to run a testnet without the code? has the Moneta testnet been running for over a year now as Robert claimed?